During my adventure of island hopping around the Andaman Sea, I went to 9 different islands and I can consider the island of Ko Mook, also called Koh Muk, my favourite. I´m aware that people have different tastes and experiences on islands, so it might not be everybody´s favourite. But I found it well worth to dedicate a full article to this gorgeous island. So if you´re curious to my experience on this treasure hunting ´Cast Away´ island or if you´re planning to travel there yourself and are looking for some practical information, then just keep on reading. I will share my personal experience, things to do on the island and will include some practical travel information about this amazing island of Ko Mook. Ko Mook is a real ´Cast Away´ island! I always wanted to go to typical tropical ´Cast Away´ island and even though I have been to smaller tropical islands like Caye Caulker in Belize, Veligandu Island on the Maldives, some islands on the Philippines and the Gili Islands between Bali and Lombok, for me they never made it completely like being on such an island you see in certain movies or series like Lost. For me they were either too touristic or too luxury for that. But on Koh Mook I felt like my dream came true! Koh Muk felt like being on a ´cast away´ island! 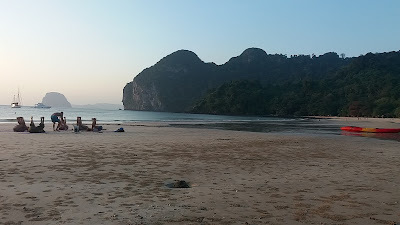 The Thai word of ´Muk´ means pearl and I completely see where the name of this island comes from. The island is very untouched and a true example of a place where nature still outbalances humanity. I think it is a true pearl laying in the Andaman Sea. 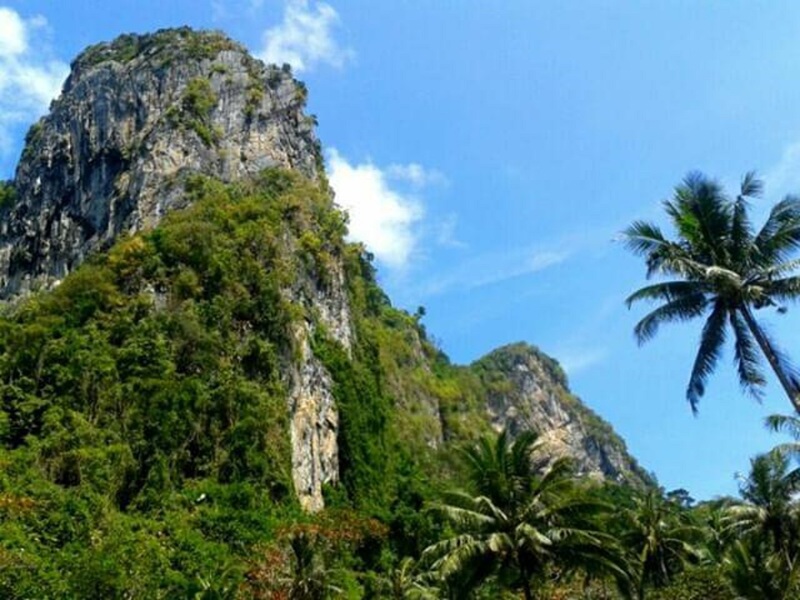 The main attraction of Koh Mook is the Emerald Cave, which might be the pearl of the island. 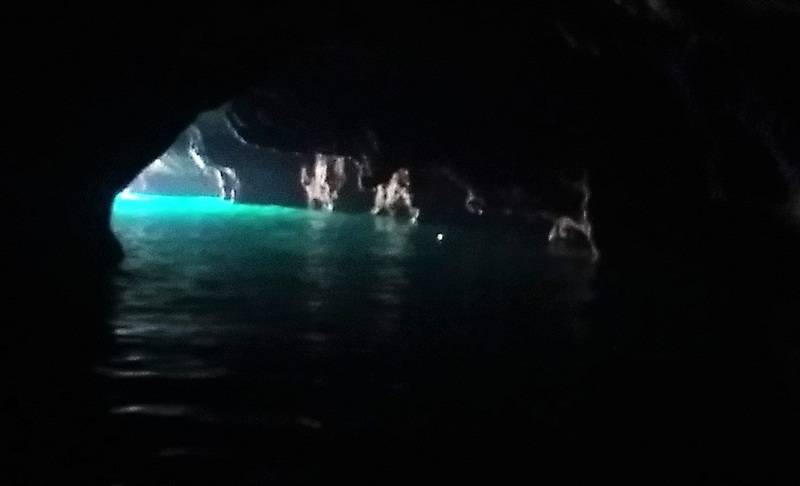 The Emerald Cave got her name due to the blue-greenish colour from the sunlight reflecting upon the water which you can see when you are in the cave. 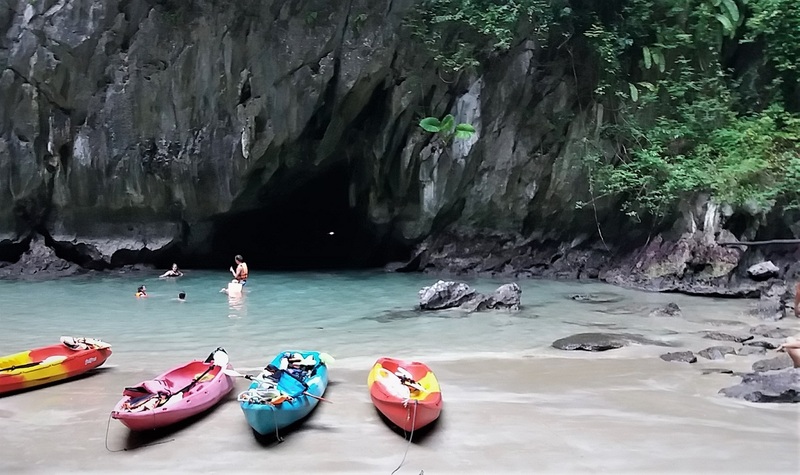 But besides the emerald cave there are also hiking trails to do, you can kayak around the island, visit the local village and there´s even a scuba dive center. Why is Koh Mook my favourite island so far? Well, I just loved the fact that the island is so robust with an overwhelming jungle, the most precious beaches and the chilled vibe of the local people. 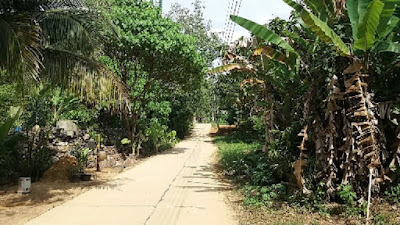 Even though there are many things to do which I will cover in this article, I also truly enjoyed just walking around the island where no cars drive around. 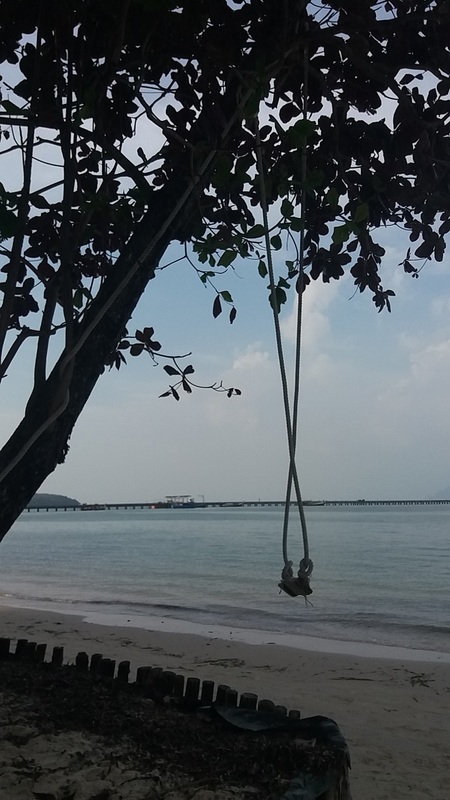 For a relaxing day I would just walk across the island from my stay at Koh Mook Garden Beach Resort to Had Farang Beach, which takes about 30 minutes. Small roads where only tuk-tuks will pass by whilst children wave at you with a friendly ´Sava dee Kaa´ or you meet your bright smiling tuk-tuk taxi driver again who picked you up from the ferry: ´Hi Tony!´. You pass some local houses or fruitshake stands while the Thai people either are taking a nap or greet you also with a bright smile, in the meantime you´re constantly surrounded by an immense nature, hearing the jungle sounds and the most beautiful butterflies will cross your path all the time. For the night time you can go to Ting Tong Bar or Mong Bar where local island guys are copying Bob Marley on their reggae nights. Spending the night with stormy weather, jungle noises and weird insects! At night time the weather sometimes went really stormy with thunderstorms and heavy rains. 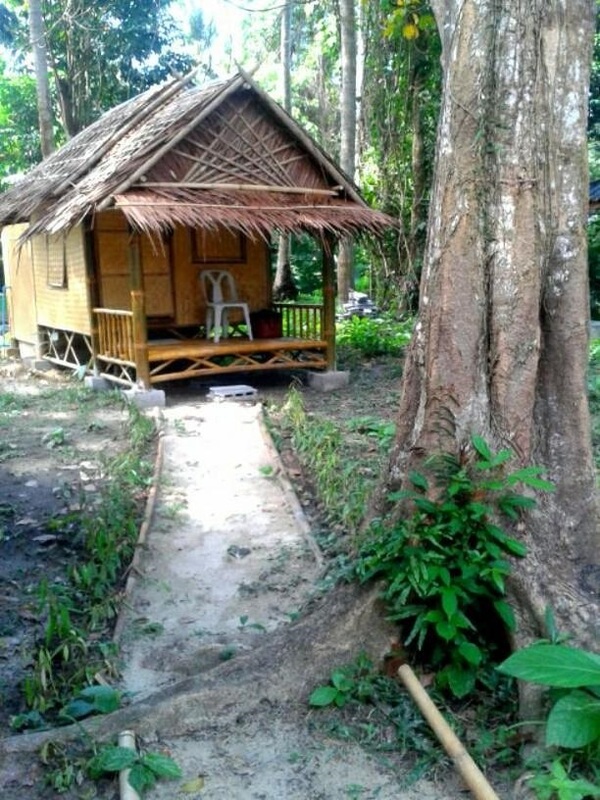 I was staying in a small, budget beach hut in the Koh Mook Garden Beach Resort, which almost felt like camping. The hut was not more than a mattress on the floor, a fan and a bright pink mosquito net, which was absolutely necessary due to all the insects flying and crawling around at night. The attached bathroom was half open, and at some point there was something flying around which looked like a moth but had the size of a bird. I never ever saw something like this before in my life and I still don´t even know what it was but I was glad when it finally left again! Noises from the jungle made me sometimes having to push scary thoughts away: “What if a snake decides to come in?”. It might not sound very attractive, but it really was. It was just part of the adventure and contributed to the overall amazing experience I had on the island of Koh Mook. The next morning you wake up with a calm sea, a brightly shining sun like the night and bad weather never happened. Yes, exactly like in these movies ´The Blue Lagoon´, ´Cast Away´, you name it even the serie ´Lost´ if you like. For me it didn´t really feel like Thailand but more like being on an island in the Pacific somewhere. First of all you can´t miss a visit to the Emerald Cave. You can go there either by boat or take a kayak and go by yourself. If the weather conditions allow you, you can even kayak there all the way from Garden Beach Resort or Sivalai Beach. When I was there the sea was a bit rough on that side of the island, so we kayaked from Had Farang Beach, also known as Charlie Beach. It took us about 20 minutes to reach the cave. Once you´re there, I can recommend you to bring a torch, you enter the pitch dark cave and kayak through for a short distance, like 100 metres, before you arrive at a secret beach. If you go there by boat you can swim through the cave. The secret beach is surrounded by high cliffs and jungle, there´s no other way to reach this place than through the Emerald Cave. Bring a torch or, if you don´t have one, take a waterproof cover for your cell phone with you. 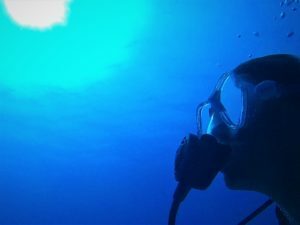 Although the dive center ´Chilled Out Divers´, is not running scuba dives anymore, what I found is that there are two dive centers operating at the time of writing. Because they might change, depending on the season and the amount of interest, make sure you check directly with them before you go there. As far as I´m correct, there´s one dive center in the luxury Sivalai Resort, called Trang Scuba Diving. Contact them here to check for availability and prices: http://www.trangscubadiving.com/contact/ The divecenter ´Princess Divers´ is located in the Charlies Beach Resort, close to Had Farang Beach. It is said to offer scuba diving from PADI courses to fun dives. Please make sure to check information before you go, if you´re planning to do some diving on Koh Muk. Lately things have changed and a dive center closed down so it´s a bit unsure what is happening in the future. So make sure to contact the dive centers to check what´s available and it might also be season dependent. Koh Muk Island Map: treasure hunting? Other then just crossing the island on the proper roads, which I already highly enjoyed, you can do a few proper jungle tracking hikes on Koh Mook. 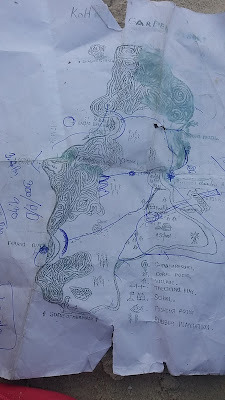 I name the following routes from staying at Koh Mook Garden Beach Resort, since the map on the photo shows the routes from there, on the right, close to the jetty if you can read this ´treasure hunting´- map! 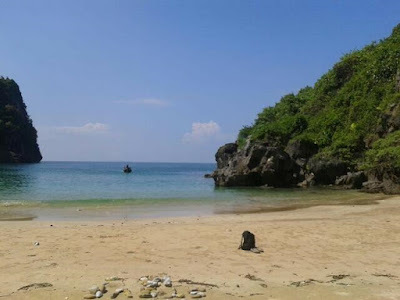 If you stay in the area of Had Farang Beach (Charlie Beach), you can add another 20 to 30 minutes from Had Farang Beach to Koh Mook Garden Beach Resort. You can hike to the viewpoint which will take you over 45 minutes and a part of it is pretty steep. Make sure to wear hiking boots or proper sandals, I can not recommend to do this on flipflops. It can get a bit slippery with loose stones on a steep gradient. A nice time to do this hike if for sunset or sunsire. Expect monkeys and snakes! This trail is through a very tightly grown jungle. It might be recommended to put closed shoes for this one. There are no motortaxi´s or whatsoever allowed, this is pure nature. After hiking for about 1.30 hrs, you´ll arrive at a precious beach. Although there is not much left from the statue and the track is not very accessible, it is still another hike you could do. I didn´t do it myself and heard that the path is very overgrown, but if you´re in for another adventure, go for it! Always make sure to bring enough water, sunscreen and mosquito repellent with you. There is a local village, on a short walk from Garden Beach Resort. Here you can find a small supermarket with basic stuff, some very nice places to eat and friendly people. 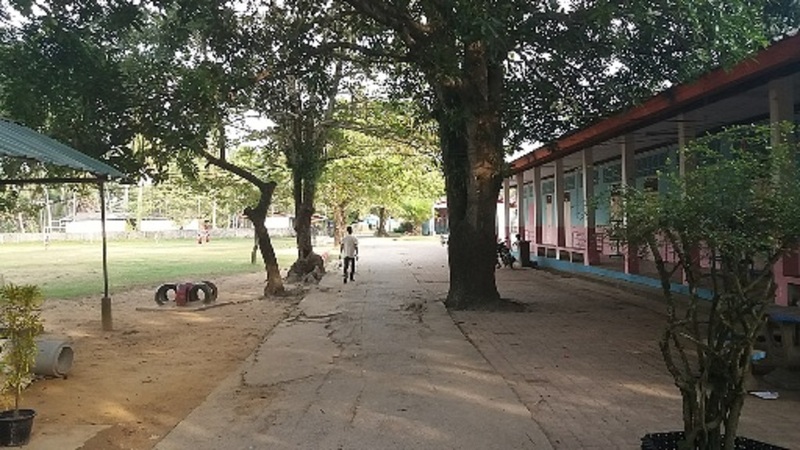 You can also see the local school. I like how on Koh Mook the local people mix well with the tourists. The place ´Ma Kin Ni´ (to the right on the main path if you come from Koh Mook Garden Beach Resort) offers good food and fresh made coffees. Other things to do include hiring a bicycle for either 50 or 100 Baht, depending on the bike and the shop. You can rent a kayak for 100 Bath per hour or for 300 Baht in total at Garden Beach Resort. If you find it too hot and don´t like to get too active you can rent a motorbike for 250 Baht. You can go snorkelling by yourself, book a day tour to Koh Kradan or do a snorkelling trip excursion. 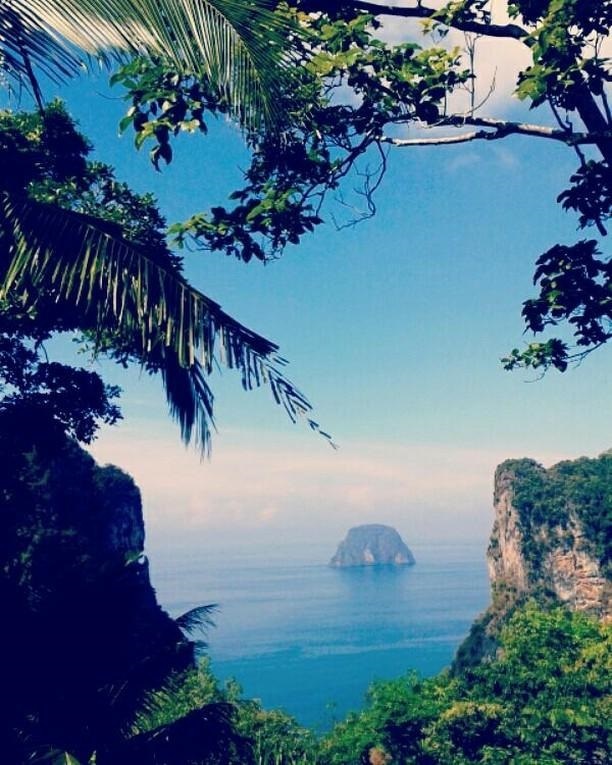 Shorlty, if you like hiking, cycling, kayaking, nice beaches and some quieteness with an amazing nature and some adventure, you can´t go wrong on the paradise island of Koh Mook! There are also yoga classes available on Had Farang Beach (Charlie Beach). If you stay one week at Koh Mook Garden Beach Resort, you get a kayak for free for 1 day and they also offer free bicycle rent for her guests. How to get to Koh Mook? 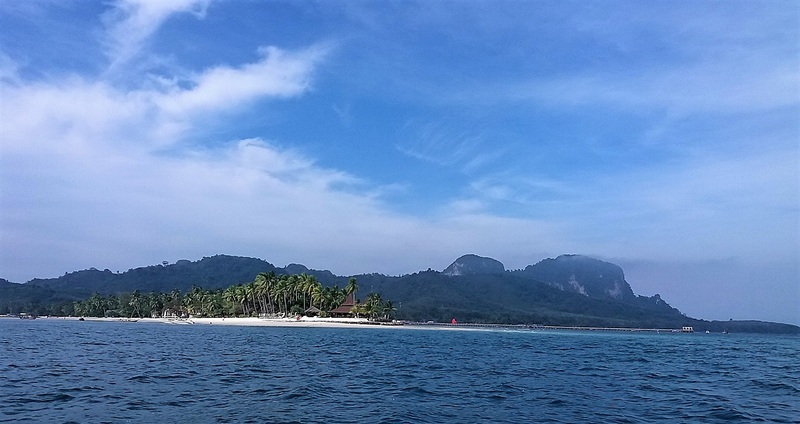 You can reach Koh Muk by boat from the bigger islands Koh Lanta and Koh Libong, or the smaller surrounding islands including Koh Kradan and Koh Ngai. From the mainland it´s reachable from either Trang, Krabi or Phuket (Island). 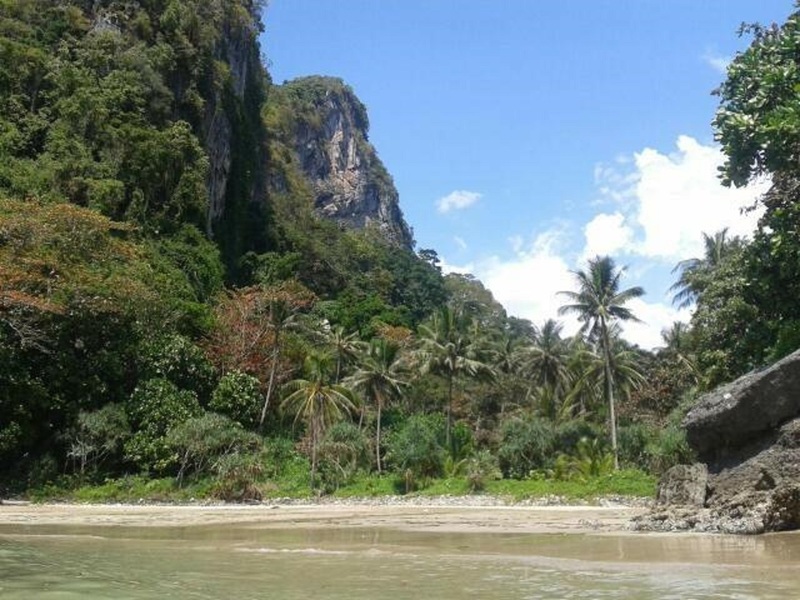 Even if you´re not looking into visiting more islands in the Andaman sea you can book the boat in combination with train or bus, depending on where you coming from. 12go.asia can book your complete trip to Koh Mook for you, from almost anywhere inThailand. They have all services available including boats, busses, trains and even plain tickets. Also, no matter if you´re looking for a fast speedboat and willing to pay a bit more or travel on a budget and take the slower ferry. I´ve booked my ticket from Koh Lanta to Koh Mook locally on Koh Lanta but found that 12go.asia offers the same tickets for the same price. You can´t really go wrong with them since they offer and compare all different companies. You can click through from the links provided or use the search box below and I will get a small commission too. Thank you! Are there any banks or ATM´s on Koh Mook? This is pretty important to know. There are no ATM´s on Koh Mook. And one friend I met on the island needed to leave at the day she planned to leave, because she didn´t bring enough cash with her while she actually wanted to stay longer. Actually, the next day I saw a sign from a shop doing cash out on your card, but I´m pretty sure they charge extra for it. If you need them, they are located in the local village, just look out for the above sign on the right before entering the mainstreet. 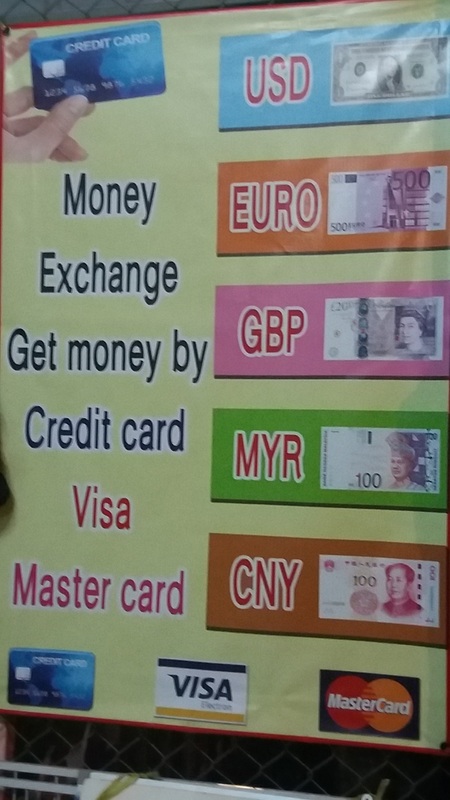 There are no ATM-machines on Koh Muk, so the above only works for mastercard or visa. At Dada´s place (Garden Beach Resort), you can pay on card, but I can recommend to check with your accommodation beforehand if they offer you this choice since it´s not very common yet at the time of writing. 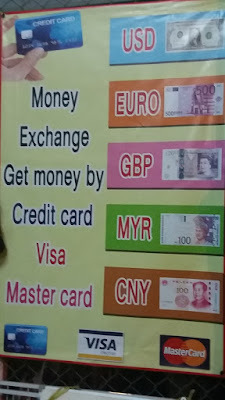 There are places where you can change your money into Thai Baht. 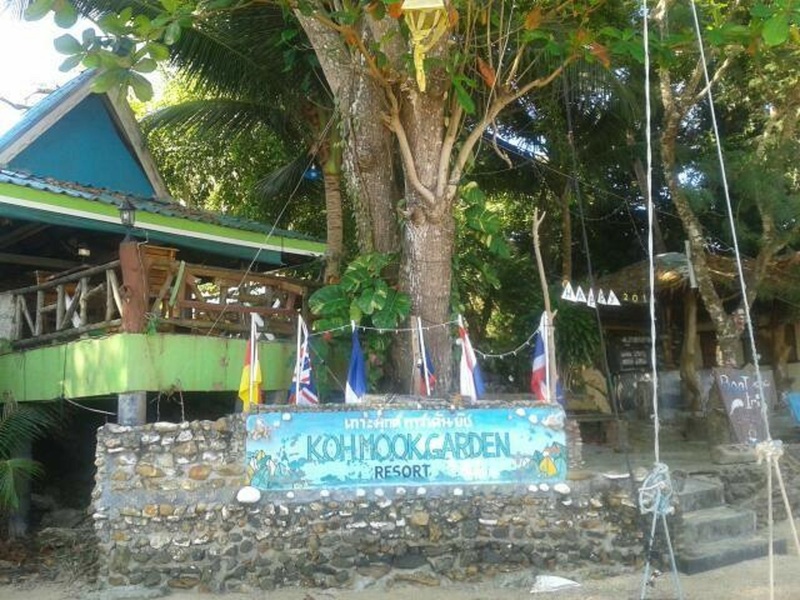 Personally, I had a great stay in Koh Mook Garden Beach Resort. So I´ll start with this accommodation and can include some more information based upon my experience. After that I will name some place I´ve seen of heard about from other travellers I met. I will arrange them in price order, from budget to luxury. My stay at Koh Mook Garden Beach Resort, also called ´Dada´s place´, was really good for a budget price! The place is a bit family ambient orientated so don´t go there if you´re looking for a party place, although I think this is hard to find on Koh Mook anyway. I met families staying here as well couples and single travellers. The place is right at the beach but you can only swim at high tide, although you´re at walking distance from the beautiful quiet beach at Sivalai Resort where you can swim. What I liked the most about this place was the feeling you´re staying in the jungle but are still at the beach, so you can hear the jungle sounds and the waves at night! 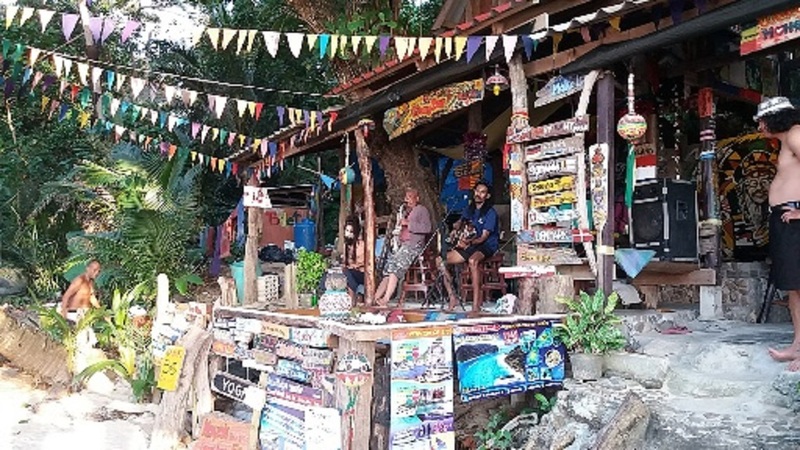 One thing to consider is that it´s a bit further away from Had Farang Beach, so if you like to hang out at night, keep in mind that most of the tuk-tuk taxis run till about 10 pm. After that, you can do a 30-minute jungle walk in the middle of the night! Although when we went to the reggae night, we found a guy willing to take us to Dada´s place on his tuk-tuk. I found a very good deal on booking.com for a small beach hut, I only paid 500 baht per night, which is around €12,-. For a location right on the beach with the breakfast included. My hut was tiny though, but cosy too and with a bright pink mosquito net, a mattress on the floor and an open bathroom, it felt almost like camping! There´s a restaurant in the place and Dada, the owner, can help you organise anything you need from a day tour excursion to hiring a kayak or a motorbike. She also offers one of the cheapest prices on the island for excursions and hiring stuff. You can book the place or find more information by clicking on this link. Other accommodations for a low budget traveller include Koh Mook Hostel, they offer beds in shared dorm rooms for 350 Baht including breakfast. Bamboo Hut Bangalow offers small huts for about the same price as Koh Mook Garden Beach Resort but they´re located a bit closer to Had Farang Beach (Charlies Beach), so you can walk home from Mong Bar. If you´re looking for a place closer to Had Farang Beach and would like a bit more comfort, I can recommend Phusam Big Resort. My friend was staying there and had a great time. You pay a bit more but you´ll get a closed bungalow with a wooden floor instead of bamboo where everything can ´crawl in´. They also offer a minibar and coffee and tea facilities and you can choose for airconditioning or a ventilator. The breakfast is included in their price. Rooms from 1000 Baht. Click on this link to find more information or to book the place. Other accommodations for the flashpackers include Koh Mook Coco Lodge which looked like a descent place, also located close to Koh Mook Garden Beach Resort. They offer bamboo bungalows for 900 Baht. Another good places I heard about in this area for this price category is Smile Bungalow, located close to the local village and offering bungalows for about 900 Baht. There are a few places offering luxury and comfort if you´re willing to pay for it. I walked inside the Sivalai Beach Resort, which is the most expensive hotel on the island and it looks like there´s nothing missing here. A comfortable swimming pool and a Maldivian style white beach on your footsteps. You pay almost 5000 Baht per night. Click here to read more or book the place. Similar places in this price category are Mook Lamai Resort & Spa and Pawapi Resort. Click here for an overview of all accommodations on Ko Mook. There are over 25 accommodations on Koh Mook. You can find almost any kind of accommodation, also in the prices in between I´ve named here and you can book almost all of them on booking.com. There is also a description and information about the location for each accommodation. Booking.com provides the cheapest price and they price match if you´ll find the same holiday stay for a cheaper price somewhere else. In many cases you can also cancel free of charge within a reasonable time limit. If you click through from the links provided in this article or use the search box below, I will get a small commission. Thank you for supporting Splashpacker! Is Internet available on the island of Ko Muk? Most places on Koh Mook do offer free WiFi, however it is an island so don´t expect a high speed connection. Sometimes it breaks down but in general you can find WiFi in most holiday accommodations and some bars and restaurants. What is the best time to visit Koh Mook? The best time to visit the island is from November till April. The busiest time will be in December around Christmas and New Years, so make sure you book your accommodation well in advance if you´re planning to go around this time. If you go outside the season, from May till October, please make sure to check with ferry companies and accommodations because they might be limited or not available at all due to the rain season. Any information I forgot to include about Koh Mook? All taxi rides around the island cost 50 Baht. One other tip for walking around on the island at night is to bring a torch or use the torch on your cell phone. There is not much light if there´s no full moon. I hope you have a good idea by now about this truly amazing island of Koh Mook, Ko Mook, Koh Muk or however you like to call it. The name doesn´t matter, but the experience does and for me it was great. If you have any questions or if I forgot to cover anything, feel free to ask or share in the comment box below. Meet Toni, the local tuk-tuk taxi driver! Stay tuned for more articles about my adventures island hopping around the Andaman Sea. 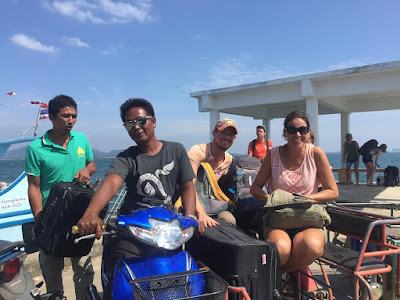 This article is more informative but I´m also creating a serie of articles in which I share my personal experience hopping around the Andaman Sea. Expect informative travelposts as well as personal travelblog updates stories including some articles about scuba diving. Some of the photos in this article (to be exact: Number 2- ´Cast Away Island´, 7- Viewpoint, 8- Sabai Beach, 11- Jungle Island, 14- Koh Mook Garden Resort and 15- my small beach hut) are provided by Martin Watters. If you like them, you can follow him on Instragram, by clicking on his name. The rest of the photos are my own and you can follow me too on Splashpacker Instagram account.